They’re monks, but they often wear civilian clothing. If they don’t talk about religion with the people whom they serve, perhaps it’s because they’re not seeking converts. Rather, they’re trying to live their convictions. They help with medical treatment or offer the occasional bit of friendly conversation. To support themselves, they sell honey in the village marketplace. They make sincere attempts to understand the spiritual lives of the Muslims whom they live amongst in Algeria’s Atlas Mountains. They are Cistercian monks, yes, but they are also men, which means they have doubts — not so much about their faith, but about the proper way to deal with the rising threat of violence from Islamist extremists. 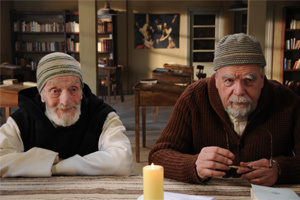 Of Gods and Men, a movie from French director Xavier Beauvois, doesn’t treat its band of monks as saints, but as people who’ve chosen to live in a certain way. Little about the film feels exalted or “spiritual,” even though many sequences are punctuated by the monks at prayer. It’s just here that Beauvois makes his best decision: He’s not pushing religious doctrine, but examining the ways in which men of faith deal with a crisis. When it becomes clear that the monks may be in grave danger, some of them talk of leaving Algeria. They want to help the villagers they’ve pledged to serve, but aren’t particularly interested in becoming martyrs. Others feel that they have made a commitment, and must see it through. The movie takes place in 1996, a time when militant Islamist elements were insisting that foreigners leave the Algeria. The personalities of the monks are not of primary importance. Christian (Lambert Wilson) guides the monks through their various decisions. Christian evidently was elected leader, but his views don’t always please his comrades. Luc (Michael Lonsdale) — who serves as the doctor — also stands out among the monks: Luc has a sweet but never sappy demeanor. He’s older, bearded and seems entirely at peace with the world and with the way he has chosen to live in it. One of the movie’s most beautiful scenes occurs toward the end when the monks gather for a meal, and listen to Tchaikovsky’s Swan Lake. As they drink wine, they share a moment of brotherly love. Without saying anything, they seem to share an understanding: Events seldom lend themselves to easy comprehension. Still, they are bonded as brothers. I suppose you could say that scenes such as this are what critics mean when they talk about quietly moving drama. Most of the villagers, like the monks, only want to get on with their lives. The extremists, who at one point murder a group of Croatian workers, don’t care that the locals and this small group of French monks live in neighborly harmony. The motivations of the extremists are as political as they are religious. Are the monks hopelessly naive? Maybe, but they’re not portrayed as men whose intelligence has been consumed by the fires of faith. When the Algerian government offers to send soldiers to guard the tiny monastery, the monks decline. As westerners who’ve had enough of imperialist power relationships, they insist — even at the cost of their lives — on looking for an alternative response. Or maybe it’s just this: Those who’ve opted for non-violence must accept the consequences of their decision. Are these monks attempting to atone for the barbarisms of French colonialism? I’m not sure that Beauvois intends for the movie to go quite that far, but he invites us to think about such matters. Of Gods and Men — bravely, I think — shows us the uneasy relationship between deep faith and a turbulent world. Quite properly, it is movie more full of questions than answers, a sobering look at the struggles of conscience.